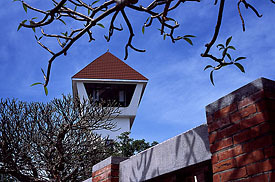 The observation tower and a statue of Koxinga overlook Anping Fort. 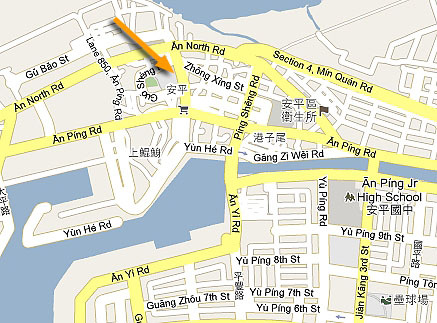 The center of any visit to Anping is the old fort. 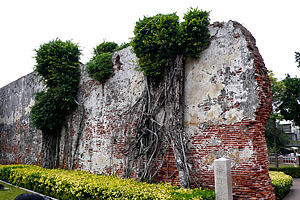 Anping Fort is built on the foundations of the Dutch stronghold named Fort Zeelandia. That fort was the anchor point of early settlements in Tainan for both the Dutch and the Chinese, and much of the settlement’s history lies in Anping’s old streets surrounding the fort. The fort has changed hands and changed names many times over. The Dutch first called it Orlande, but then changed it to Fort Zeelandia. It became Anping Castle when it was the home of Zheng Chenggong (Koxinga). The Japanese called it the Old Dutch Fort just as they were demolishing what remained after decades of neglect. They then rebuilt the fort (sort of), and renamed it Anping Fort. The KMT began development of the tourist site you see now. The observation tower is a city icon. Anping Fort isn’t much of a fort today; rather, it just mocks – in new, smooth bricks – a kind of pyramid that roughly resembles an old fort design. At the top of the pyramid is the old, western-style customs-house that the Japanese built on the site while they were carving up what was left of Fort Zeelandia. There is the observation tower (Tainan’s hideous city icon), a statue of Koxinga, some cannon replicas, and some very nice trees. It is quite lovely, polished and rather park-like, but it isn’t really a fort. It’s not all a reconstruction, though. There is some of the original fort left on-site. There are 70-meter long stretches of both the north and south outer walls of the original Fort Zeelandia as well as remnants of two bastions. All of these remnants are worth the price of admission, and can make you overlook the shallow fortress reconstruction. As a museum, the place is not bad. There are plaques all around the grounds with good English explanations. The old customs-house at the top of the fort is an exhibition hall with some nice pieces of history and a cool model of the original fort. Few of the explanations are in English in here. There is also another building on site that serves as a museum with a little more glitz. There’s a documentary and some other multimedia (all in Chinese), and some historical information in both Chinese and English. The history notes are a little choppy, however, and I doubt anyone would come away feeling like they really have a good idea of what happened, so I will give a rundown below. Fort Zeelandia was built in a ten-year period beginning in 1624 and completed in 1634 using bricks brought from the headquarters of the Dutch East India Company in Batavia (Jakarta). The Dutch had signed (forced) an agreement with the Chinese that gave them Taiwan as a trading colony. The settlement of Zeelandia was on a small island called Tayouan. 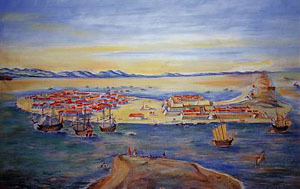 At that time, much of what is now Tainan was actually a large bay. Pretty much everything west of Jinhua Street was water except for this island. Passage to the rest of Tainan was mostly by boat, though a long stretch of the island to the south extended to some shallows that could be forded at low tide. It was a good location for a port and sea-defence, but a bad location to defend against a long siege. Enter Zheng Chenggong (Koxinga). After suffering heavy losses to the advancing Qing army, the Ming loyalist Zheng took his 25,000 soldiers and 400 ships and sailed them to Taiwan to take it from the Dutch. His intention was to build his own settlement and rebuild his army so that he could invade China and restore the Ming Dynasty. On April 30, 1661, he landed his army at Luerhman, across the bay to the north of Fort Zeelandia. He was welcomed with open arms by the Chinese peasants already living there. The Dutch had only 1200, mostly unseasoned, soldiers and just four ships capable of fighting, but they were vastly superior in firepower. The Chinese were bringing a knife to a gunfight, but the sheer size of their army and their war experience makes me wonder why the Dutch ever thought they had a chance. In an opening sea battle, the Dutch lost their most powerful ship, and that spelled the beginning of the end. Still, the Dutch at Zeelandia did not surrender. The small militia at Fort Provintia, however, did surrender and they were consequently executed by Zheng Chenggong. At any time, Zheng could’ve put forth a full-scale attack on Fort Zeelandia, but he would’ve lost too many men. His goal was to raise an army, not deplete one. He could sit comfortably in Tainan and start building his settlement while the Dutch, who had no sources of fresh water or food, sat in their castle and rotted. Several skirmishes and a handful of battles did ensue, but the results were not satisfactory for either side. When the Dutch chose to face the Chinese on open ground, they were wiped out. When the Chinese tested themselves against the cannons of Fort Zeelandia, they were equally annihilated. Zheng went about stabilizing his settlement and weeding out any remaining Dutch influence, while governor Coyett and his remaining troops prayed for reinforcements from Batavia. All the while, the Dutch found themselves diseased and starving. Reinforcements did come, but they were too few and too late. Many picked up the diseases rampant in the fort and one of the new military leaders betrayed his forces and gave Zheng battle secrets. This led to an attack that gave Zheng an upper hand and broke any remaining morale the Dutch had. On February 1, 1662, after a nine-month siege, the Dutch signed a treaty of surrender. Zheng gave them an honorable departure from the island. In subsequent years, the fort’s history seems bland by comparison. While it would’ve served as defence against the Qing, Taiwan surrendered to the Qing forces before they set foot on the island. The defensive value of the fort later diminished, and as far as a piece of antiquity goes, the Qing and Japanese saw more value in its bricks than its history. Many of those bricks were carted away to build the Eternal Golden Castle. Many others still lay buried under Anping Fort. I just found your website through Michael Turton’s blog. Thanks for all the information on Tainan. I really enjoy learning about the city of my birth. Great website. I’m planing to visit Tainan next year and blog about all the famous sights. Your blog will be a useful guide for me. Thank you for the effort.